The Magdalena Curse by F. G. Cottam, a Mysterious Review. Review: A curse … or merely a wicked situation? Which shall it turn out to be is the question readers will be asking themselves in F. G. Cottam's latest thriller, The Magdalena Curse. Cottam has written a novel that will surely draw you in to the occult. The main character, Mark Hunter, is an intense character, a father who believes his son is possessed. He engages the help of a doctor, Elizabeth Bancroft, only to discover that she may not share his opinion, and has her own ideas. He travels to Magdalena in an attempt to find answers to his questions and to hopefully find a cure for his son. He will stop at nothing to free his son. From England to the tropical rain forests of the Amazon, you travel along with the characters and are immersed in the consuming world of the occult. The story unfolds in a truly bizarre manner and may challenge your beliefs in the occult. Not a book for the faint of heart or the easily unnerved, but a wonderful book if you like to be involved in what you read. The ending is not necessarily a surprise, but how it gets there may not be what you expect. 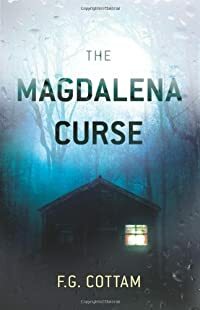 Special thanks to Lynne Gordon for contributing her review of The Magdalena Curse. Acknowledgment: Minotaur Books provided a copy of The Magdalena Curse for this review.